See Ireland in Paris as they take on France in the 2020 Six Nations Championship in Stade de France. Enjoy a magical St. Patrick’s weekend in Paris to see France and Ireland go head to head in the final round of the 2020 Six Nations. Paris is one of the most beautiful and cultural cities in the world where you will enjoy seeing some iconic sights, including the Eiffel Tower, Arc de Triomphe, Notre Dame Cathedral, The Louvre and so much more. Our packages give you plenty of options for your budget including great quality 3, 4 and 5 star hotels. Le Vert Galant is a charming, family run, 3-star hotel which overlooks a beautiful private garden. Just a short 5 minute walk to two Metro stations, it affords easy access to all of Paris’ attractions and only 40 minutes to Stade de France. The adjoining restaurant offers excellent Parisian delicacies and wholesome cuisine. *Please Note: times are subject to final slot confirmation. Enjoy pre match hospitality in the luxurious Le Tram Bleu with a special guest speaker. This amazing restaurant generates a superb atmosphere and sets the scene an unforgettable dining experience. This is an optional extra and can be included at checkout. Treat yourself to a brilliant hotel experience in the heart of Paris. Near the Montparnasse district on the fabled Left Bank, the Paris Marriott Rive Gauche Hotel welcomes you with open arms. The downtown location is a short distance from the Gare Montparnasse and several Metro stations. All of the hotel rooms are impeccably designed with floor-to-ceiling windows and plush bedding; where you can gaze out at the scenic Paris skyline. This 4-star Parisian hotel is always one of our most popular selections with fantastic food and an excellent social bar area. Located at the foot of Sacré Coeur, close to the Moulin Rouge and the Haussmann-Opéra district’s stores, the Mercure Paris Montmartre Sacré Coeur hotel offers spacious and modern rooms. Perfect for rugby supporters and romantic weekends in Paris, the hotel is within easy reach of the Gare du Nord station, St Lazare train station, the metro and the main tourist attractions such as the Eiffel Tower, Champs Elysées, Carrefour Pleyel and Stade de France. Discover Paris and luxury like never before at Paris Marriott Opera Ambassador Hotel. This perfectly located hotel in Paris, France sits nestled in the heart of the Opera District, the Galeries Lafayette and Palais Garnier are just steps away. Enjoy 4-star accommodations and amenities here, along with elegant French cuisine at the 16 Haussmann restaurant. A long tradition of excellence in the art of living awaits you in this grand 19th-century building. An emblem of Parisian life, Hotel Scribe Paris Opera is one of the most luxurious and beautiful hotels in Paris. It became a hotel of legend, a stage of modernity on which the cinema was born, a favourite place of artists and celebrities. The Scribe keeps that legacy alive today. Upgrade from a Superior Room to a Luxury Room (20m2 to 25m2) for €100 per night (very limited availability). Discover Paris and luxury like never before at Paris Marriott Opera Ambassador Hotel. This perfectly located hotel in Paris, France sits nestled in the heart of the Opera District, the Galeries Lafayette and Palais Garnier are just steps away. Enjoy 4-star accommodations and amenities here, along with elegant French cuisine at 16 Haussmann and a state-of-the-art fitness centre all on site. This is a flight only package. Accommodation is not included. Why not book our pre-match lunch in the absolutely awe inspiring Le Train Bleu in the heart of Paris? 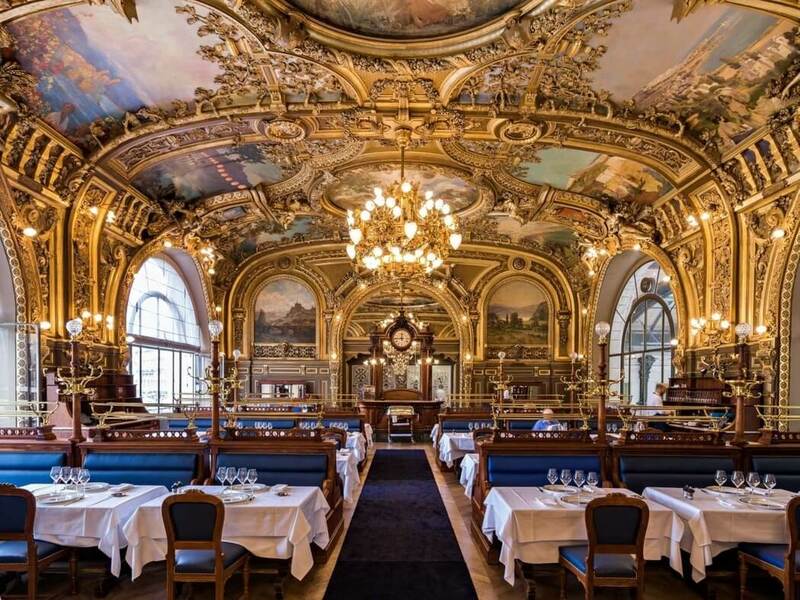 Le Train Bleu offers a majestic setting where the show takes place in the kitchen as well as the restaurant. The fine dining experience is exceptional and with a special guest speaker to stimulate the rugby conversation before Ireland take on France, you will be in flying form heading to Stade de France for the final match of Six Nations 2020. Includes a four course lunch with two glasses of wine or two glasses of beer or two soft drinks per person PLUS a rugby celebrity guest speaker. Ideally located at Gare de Lyon with a direct train service to Stade de France (just 12 minutes). Sit down at 16.00 and depart from 18.30. This is a long leisurely social affair! Booking available at checkout. Want to fly out from Cork to Paris? We have previously had chartered flight departing Cork to Paris so we expect to be able to provide the same for the 2020 Six Nations. 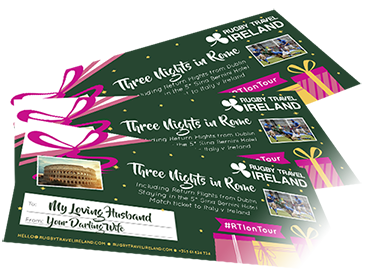 Register your interest to be notified as soon as we have a package to see France v Ireland in Paris available from Cork.